Novak “The Djoker,” is, no joke, the world’s best. In a span of 72 hours, he clinched the No. 1 world ranking and, two nights ago in London, his first ever All-England Club trophy. “It’s the best day of my life,” said Novak. To win undefeated in seven matches spanning two weeks in the oldest and most exalted of all the tennis tournaments, it ought to be the best. Wimbledon is the best. Novak is the best. 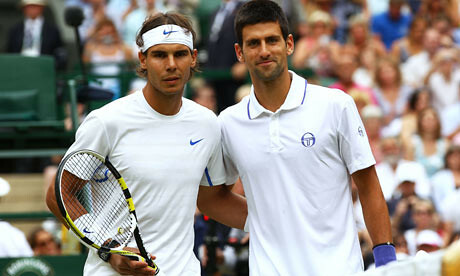 Djokovic did it by dismantling and mutilating the usually-unconquerable Rafael Nadal. In the first two sets, which Novak won, 6-4, 6-1, his game was as polished as Jason Terry’s three-pointers. Novak hardly missed. He retrieved unretrievable shots. He drop-volleyed. He was, as sports writers would term it, “in the zone.” His game flowed. He was inspired. And, buoyed by the new No. 1 ranking, mentally, he could not be defeated. He was not. Except the third set. He had a momentary lapse of focus. And, when the Spaniard won that stretch, 6-1, weren’t the members of the “Rafa We Love You Forever Fans Club” relieved? They must have thought… if Rafa can only get the fourth set… we’ll score a come-from-behind victory. Novak didn’t allow it. Oddly, except for that third set, it was Rafa, the 10-time Grand Slam champion, who was nervous at critical points of the match. At 4-5 in the first set, anxiety crept into the left-hander’s fingers. Same with the latter stages of the fourth set when he made plenty of un-Rafa-like mistakes. It begins in the mind. Tennis, you think, is physical? Like boxing? True, these sports are brothers—they are a handful of games that are one-on-one, mano-a-mano. And, true, a muscular Nadal flexes his biceps to win points. Tennis, like boxing, is physical. But it’s more mental. Take Pacquiao. It’s his mind that defeats the Mexicans. The same with Novak. Beginning late last year when he won for Serbia the Davis Cup crown, that win changed his outlook. I AM THE CHAMPION. I CAN BEAT R + R.
And, yes, has he beaten the Roger-Rafa combination, these two who’ve combined to corner that No. 1 ranking since 2004. Yes, in one of those hard-to-believe sports statistics, for the past 7.5 years, only Nadal and Federer have been tennis’ No. 1. July 4, 2011. Independence Day. A new No. 1. The serving Serb is an ace. request information re: Davis Cup tie schedule for September 16, 17 and 18.